On June 8, 1950, the Red Sox played host to the St. Louis Browns at Fenway Park. The Red Sox had crushed the Browns the previous day by a score of 20-4. That game proved to be only the appetizer to the upcoming entrée. The Red Sox, whose offense clicked at historic levels that season, were ready to set a few records on that Thursday afternoon. This was one of several Red Sox clubs from that era victimized by there being no playoffs. Two teams played for the World Series in those days, there were no playoffs leading up to them. You had the best record in the league or you didn’t. 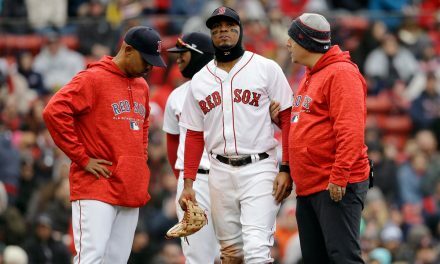 The 1950 Red Sox went 94-60, which is more wins than either of the division winning teams the Red Sox have fielded the past two seasons, in fewer games. However, they did not get the chance to play for anything. The Red Sox also scored 1067 runs as a team in 1950, only 40 less than the Major League record. They did all this while missing Ted Williams for half the season, who broke his elbow at the All-Star Game. Williams had hit 28 home runs and driven in 97 runs over just 89 games. Six of their eight regulars that season batted over .300, with the other two finishing above .290. Their top utility player, Billy Goodman, batted .354! This team deserved a chance to play in a postseason. The Red Sox bats did not disappoint in the previous days game, scoring 20 runs on 23 hits. The team had hit five home runs in the onslaught. 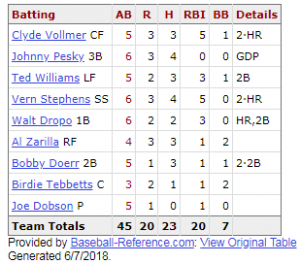 Red Sox box score from June 7, 1950. The Red Sox featured nearly the same lineup as the day before, and why not? They had just banged out 20 runs after all. The only differences were in the 8-9 spots. Matt Batts replaced Birdie Tebbetts at catcher batting 8th, and the 9th spot was filled by the pitcher, Chuck Stobbs. 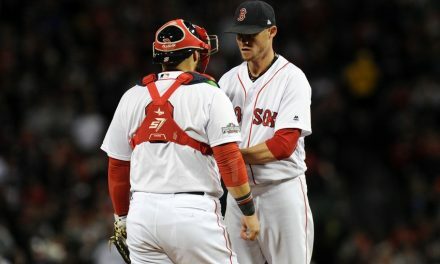 The team didn’t look like they were about to accomplish something historic when they went scoreless in the first inning. Johnny Pesky and Ted Williams were stranded on base in the inning. The floodgates were opened up in the 2nd inning. Coming off a three hit day, Al Zarilla started the inning with a double. Take note of that, as he would have a few more of them before the game ended. After a walk to Bobby Doerr, backup catcher Matt Batts doubled in the first run of the game. The pitcher Chuck Stobbs then drew a walk, another common theme of the game. The bases were loaded with a run already in. Two straight fly balls netted just one run but Ted Williams was due up with two men still on base. He unloaded on the Cliff Fannin offering to right for a three-run homer and the Sox had themselves a five run inning. They weren’t finished. After a walk Walt Dropo homered to left field to make it seven runs in. Al Zarilla then doubled for the second time during the inning and was brought home by Bobby Doerr. When Fannin finally got out of the second inning the Red Sox had 8 runs in and had sent 12 men to the plate. The Browns pinch-hit for Cliff Fannin in the third, ending his day with just two innings pitched. They picked up three runs on three hits and two walks in the inning to make it an 8-3 ballgame. The Red Sox offense then went to work against Cuddles Marshall, not a daunting name. Chuck Stobbs drew his second walk in as many plate appearances. Two more walks had the bases loaded against Cuddles with just one out. Vern Stephens doubled to left to score two, followed by Walt Dropo’s two-run single. The score was 12-3. 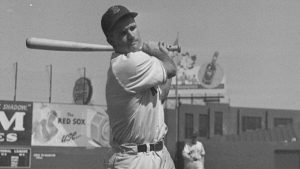 Al Zarilla doubled once more and Bobby Doerr brought home a run with a sacrifice fly. The Red Sox reloaded the bases, again. Chuck Stobbs drew his second walk of the inning, third of the game, and yes, he was the pitcher. But Cuddles Marshall was able to get out of the inning with “only” five runs scored. The Browns went 1-2-3 in the top of the 4th and the Red Sox offense went right back at it. Vern Stephens scored Johnny Pesky with a triple, then was driven home by Walt Dropo. Bobby Doerr hit his first homer of the game, a 2-run shot, and Cuddles Marshall’s day was over. Marshall allowed nine runs while only recording four outs. Sid Schacht replaced him and fared better, only if because he kind of had to. Chuck Stobbs drew his fourth consecutive walk, a record for walks drawn by a pitcher in one game. Chuck Stobbs set a record for pitchers by drawing 4 walks. The Red Sox scored two more in the fifth but were held scoreless in the sixth. Meanwhile, Stobbs wasn’t having much trouble on the mound or in the batter’s box. After a scoreless sixth he had still allowed runs in just the one inning. 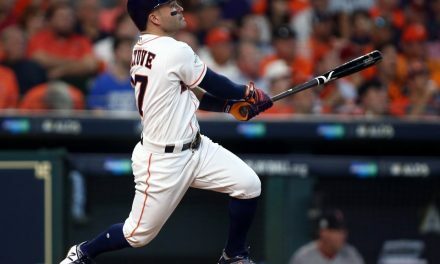 The seventh gave him more trouble, as he walked two and hit a batter. However, the Browns still failed to score so the game remained 22-3 Boston at the 7th inning stretch. The Sox wasted no time in adding to their lead in the bottom half. Al Zarilla led off the inning with his fifth hit of the day, and the first that wasn’t a double. Bobby Doerr then followed him up with a 2-run shot over the monster in left, his second home run of the game. Doerr had now driven in seven runs on the day. The next three batters went down in order; 24-3 Red Sox after seven. Sid Schacht had pitched alright considering how others before him had fared, but he lost it in the 8th. The Red Sox homered three times off him in the inning before he was removed with one out. Johnny Pesky opened the inning with a double to right, his fifth hit of the day. 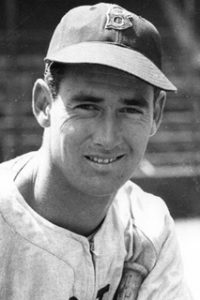 Ted Williams then hit the first of three 8th inning homers, his second of the day. Williams drove in five runs in the blowout. Vern Stephens singled for his third hit of the day. Walt Dropo followed with his second home run of the game. Dropo had four hits and seven runs batted in. 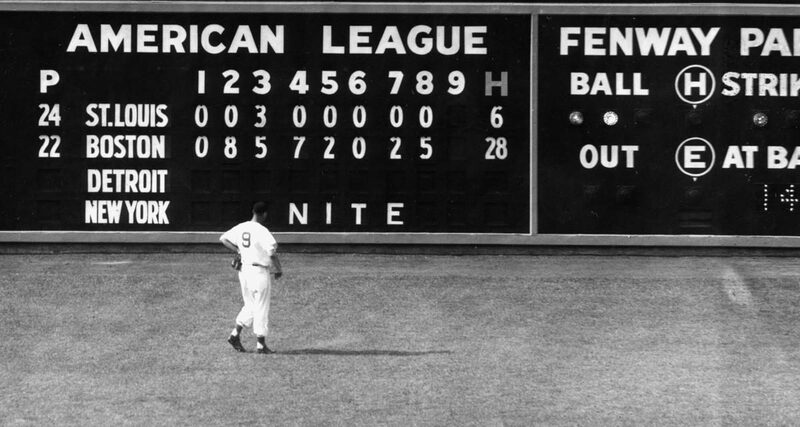 After a flyball out, Bobby Doerr deposited his third baseball over the wall in left field. Doerr had four hits, three of them home runs, and eight runs batted in! Schacht’s night was over, as was the scoring for the Red Sox. The Red Sox had set a Major League record with their 29 runs scored in the game. Their 29-4 victory also set the record for largest victory in big league history. The 60 total bases accumulated by Red Sox hitters was also a record. Beyond that, coupled with their 20-4 thrashing of the Browns the day before, the Red Sox had set a record with 49 runs scored and 51 base hits over a two game span. 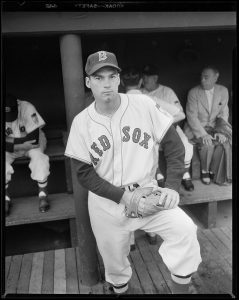 Throw in pitcher Chuck Stobbs record four walks in one game for a pitcher (not to mention his two base hits) and the Red Sox were living large. Bobby Doerr hit three home runs and drove in eight runs in the 29-4 demolition of the Browns. Is Sandy Leon a Viable Option?